Note: This tutorial was built for Xcode 10 and iOS 12. Nobody’s perfect. And once you implement UndoManager, your users don’t have to be either. 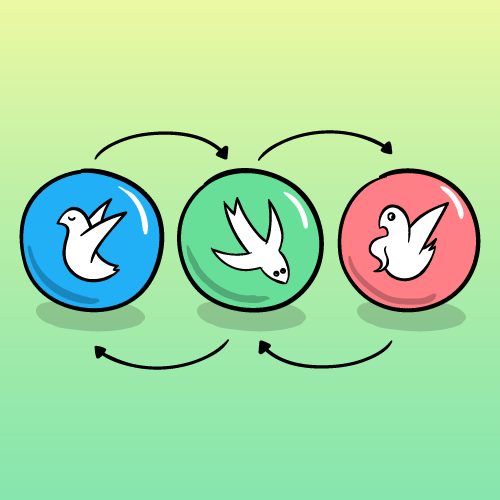 In this tutorial, you’ll build an app called People Keeper to improve your local reasoning with Swift value types and learn how to use that improved local reasoning to achieve flawless undo/redo implementations. The app is pre-populated with some folks you’ve supposedly encountered and wanted to remember. Click on Bob, Joan and/or Sam, and you’ll see that their physical features, likes and dislikes are specified in the cells below the preview. 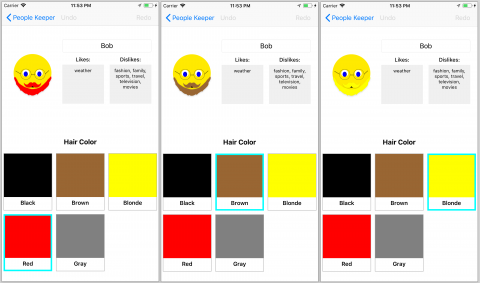 Tapping Bob in PeopleListViewController (left) opens PersonDetailViewController (right). The screenshot series on the right shows PersonDetailViewController‘s scrolled page contents. To understand the starter code, click through the project files and read the comments throughout. It’ll be your job in this tutorial to program the ability to add and edit your contacts. What if Sam shaves his mustache or Joan starts wearing glasses? Or, during a particularly harsh winter, Bob decides that he dislikes everything including the weather? It’s useful to be able to update the people in People Keeper in real time. Using a switch statement, you execute the case that matches the enumeration value corresponding to the current section. If the user selects a hair color, set person‘s hair color to the Person.HairColor value at the selected row of the index path. 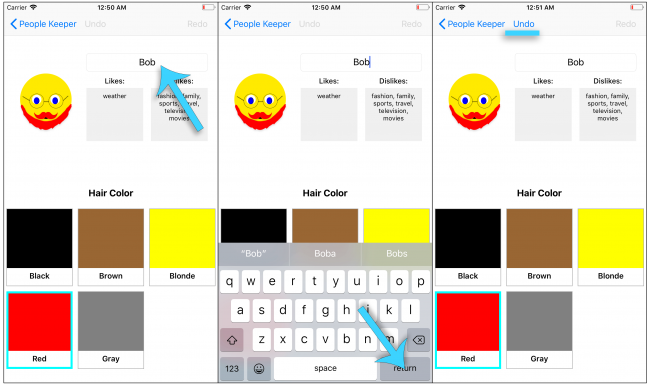 If the user selects a hair length or eye color, set the hair length or eye color as well. When the user taps the glasses option, person‘s glasses Boolean becomes true. facialHair is a set since it can contain multiple items. 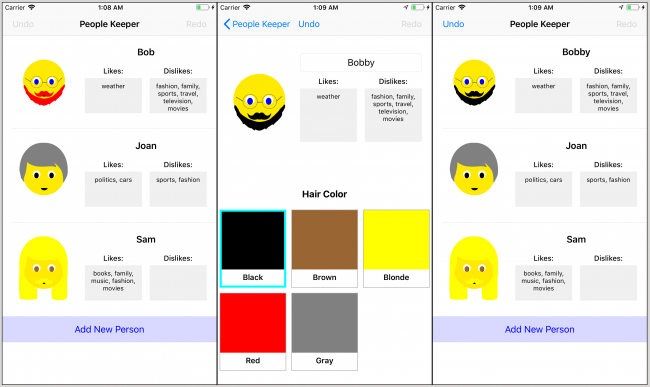 When the user selects a facial hair style, insert it into the facial hair set. If the user selects a topic in the likes or dislikes section, add it to the likes or dislikes set respectively. Furthermore, a topic can’t be both liked and disliked, so if the user likes an item, deselect its cell in the dislike section and remove it from the dislike set and vice versa. Update the preview and selection UI by reloading the collection view. Here, you specify that only the selected facial hair, glasses, likes and dislikes should be deselectable upon repeated tap. Deselection in any other section should only happen when the user selects another item in that same category. When the user deselects a facial hair style, likes or dislikes, you remove that deselected item from its respective set. When the user deselects the glasses feature, you set the glasses Boolean to false. UndoManager is a general-purpose undo stack that is capable of simplifying your app’s state management. It can store whatever object or UI states that you’d like to track along with a closure, method or invocation capable of traversing back and forth through those states. Although it simplifies undo/redo when implemented properly, a lesser rival developer will likely implement UndoManager in a way that leads to fatal bugs. The two undo stacks that follow demonstrate a flawed example and a more successful example. Undo Stack #1 is a sequence of small steps that are each responsible for modifying the model and then the view to match. Though this strategy could work in theory, as the list of operations grows, errors become more likely because precisely matching each change in the model to each change in the view becomes increasingly difficult. What does the model look like after you pop the first undo operation off the stack? Whether or not you got those answers right, perhaps you can imagine how multiple insertions and deletions can complicate the index calculation of following insertions, deletions or updates. This undo stack is order-dependent and mistakes can cause inconsistencies between your data model and view. Does this error sound familiar? 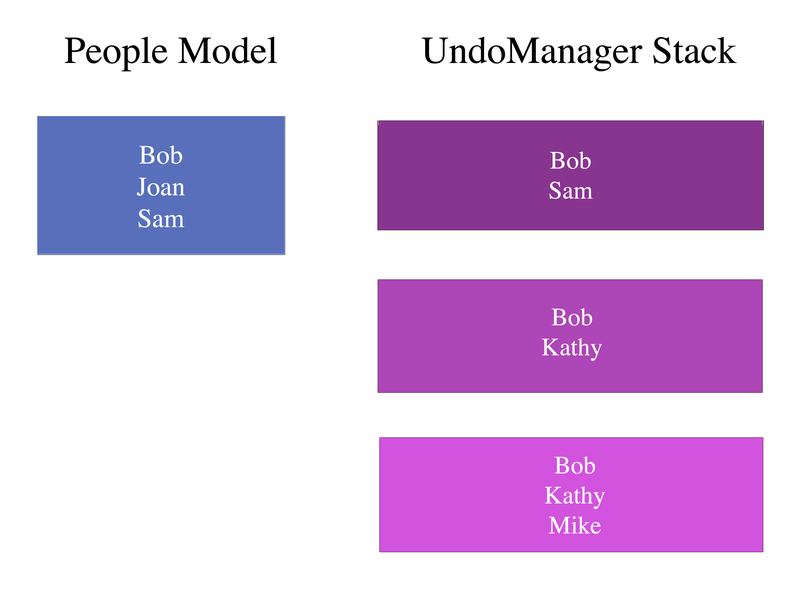 To undo an operation, you can replace the current model with a model on the undo stack. Undo Stacks #1 and #2 do the same thing, but #2 is order-independent and thus less error prone. personDidChange(from:) takes the previous version of person as a parameter. Reloading the collection updates the preview and cell selections. undoManager registers an undo operation which, when invoked, sets self.person to the previous Person then calls personDidChange(from:) recursively. personDidChange(from:) updates the UI and registers the undo’s undo, i.e., it registers a redo path for the undone operation. 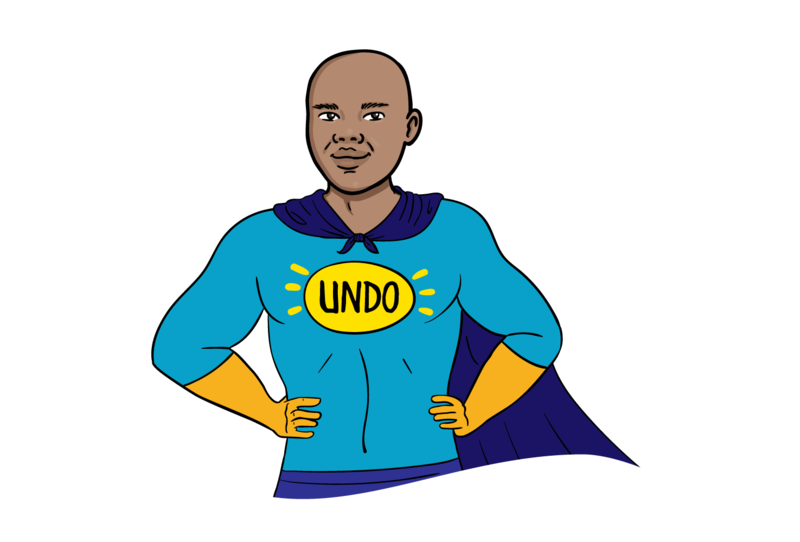 If undoManager is capable of an undo — i.e., canUndo, enable the undo button — otherwise, disable it. It is the same for redo. While the code is running on the main thread, the undo manager doesn’t update its state until after this method returns. Using the DispatchQueue block allows the UI update to wait until this undo/redo operation completes. to retain an instance of the original person. in order to register an undo that reverts to fromPerson. You removed collectionView?.reloadData() because that is already called in personDidChange(from:), so you don’t need to do it twice. to trigger undo and redo respectively. When the user shakes his or her device running the app to undo/redo, NSResponder goes up the responder chain looking for a next responder that returns an NSUndoManager object. When you set PersonDetailViewController as the first responder, its undoManager will respond to a shake gesture with the option to undo/redo. Notice that tapping undo/redo doesn’t change the preview. Again, build and run your app. Try changing a person’s hair color a few times, undoing and redoing. Now, look at the debug console and you should see that, whenever you undo/redo, both print statements output only the final selected color. Is UndoManager dropping the ball already? Not at all! The issue is elsewhere in the code. Local reasoning is the concept of being able to understand sections of code independent from context. In this tutorial, for example, you’ve used closures, lazy initialization, protocol extensions and condensed code paths to make portions of your code understandable without venturing far outside their scopes – when viewing only “local” code, for example. What does this have to do with the bug you’ve just encountered? You can fix the bug by improving your local reasoning. By understanding the difference between reference and value types, you’ll learn how to maintain better local control of your code. Reference and value are the two “type” categories in Swift. For types with reference semantics, such as a class, different references to the same instance share the same storage. Value types, however — such as structs, enums and tuples — each hold their own separate data. Solution Inside: person.face.hairColor == ?? The reference semantics in question one hurts local reasoning because the value of the object can change underneath your control and no longer make sense without context. so that Person now has value semantics with independent storage. Undoing and redoing selections now works as expected. When the text field finishes editing, set person‘s new name to the field’s text and register an undo operation for that change. In order to fix this, you could compare the original and updated names, and register the undo only if those two values don’t match, but this is poor local reasoning — especially as person‘s property list grows, it’s easier to compare entire person objects instead of individual properties. As it turns out, there’s no built-in way to compare Person objects since several of their properties are composed of custom types. You’ll have to define the comparison criteria on your own. Luckily, struct offers an easy way to do that. Now, if two Person objects share the same name, face, likes and dislikes, they are “equal”; otherwise, they’re not. Note: You can compare the Face and Topic custom objects within ==(_:_:) without making Face and Topic Equatable since each object is composed solely of Strings, which are inherently equatable objects in Swift. Navigate back to PersonDetailViewController.swift. Build and run. The if fromPerson == self.person error should have disappeared. Now that you’ve finally gotten that line to work, you’ll soon delete it entirely. Using a diff instead will improve your local reasoning. In programming, a “diff” compares two objects to determine how or whether they differ. By creating a diff value type, (1) the original object, (2) the updated object and (3) their comparison can all live within a single, “local” place. struct Diff holds both the original (from) and new (to) person values. If from and to are different, hasChanges is true; otherwise it’s false. diffed(with:) returns a Diff containing self’s Person (from) and the new person (to). It now takes the entire Diff and not just the “from” object as a parameter. to use diff‘s hasChanges property. Also remove the two print statements you added earlier. Before replacing the now invalid calls to personDidChange(from:) with calls to personDidChange(diff:), take a look at collectionView(_:didSelectItemAt:) and collectionView(_:didDeselectItemAt:). In each method, notice that the variable to hold the original person object is initialized at the top of the class, but not used until the bottom. You can improve local reasoning by moving the object creation and use closer together. modifyPerson(_:) takes in a closure that receives a pointer to a Person object. var person holds a mutable copy of the class’s current Person. oldPerson holds a constant reference to the original person object. Execute the (inout Person) -> Void closure you created at modifyPerson(_:)‘s call site. The code in the closure will mutate the person variable. Then personDidChange(diff:) updates the UI and registers an undo operation capable of reverting to the fromPerson data model. in order to condense the code using the modifyPerson(_:) closure. to simplify the code with a closure. This design approach centralizes our update code and thus preserves “locality of reasoning” for our UI. Select all the code in the class, then navigate to Editor > Structure > Re-Indent to properly realign the new closures. This sets the class’ person to the updated person. This restores the previous person when undoing. Build and run. Check a person’s detail view and everything should work as expected. Your PersonDetailViewController code is complete! Now, tap the back button. Uh-oh… Where did those changes go? You’ll have to pass those updates back to PeopleListViewController somehow. var personDidChange: ((Person) -> Void)? Unlike the personDidChange(diff:) method, the personDidChange variable will hold a closure that receives the updated person. When the view disappears upon returning to the main screen, the updated person will return to the closure. Now you’ll need to initialize that closure. Back in PeopleListViewController, scroll to prepare(for:sender:). When transitioning to a selected person’s detail view, prepare(for:sender:) currently sends a person object to the destination controller. Similarly, you can add a closure to that same function to retrieve a person object from the destination controller. This initializes detailViewController‘s personDidChange closure. You will eventually replace the placeholder comment with code to update the data model and UI; before that, there’s some setup to do. Diff defines a PeopleChange enum, which indicates 1. Whether the change between from and to is an insertion, removal, update or nothing and 2. Which Person was inserted, deleted, or updated. 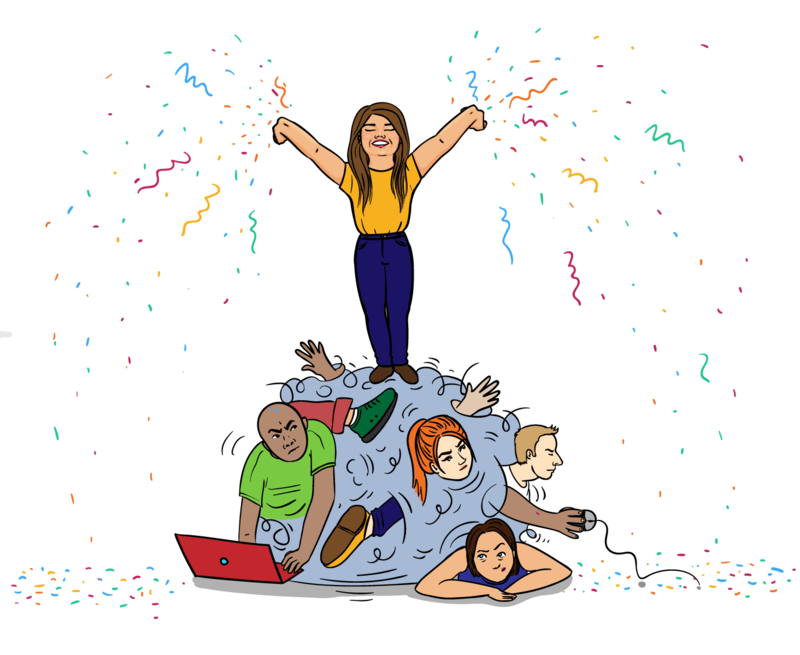 Diff holds both the original and updated PeopleModels and the diff’s PeopleChange. changedPerson(in:) compares self’s current PeopleModel with the people model passed in as a parameter, then returns the inserted/deleted/updated Person if one exists. If one array is smaller/larger than the other, find the larger of the two arrays, then find the first element in the array not contained within the smaller array. If the arrays are the same size, then the change was an update as opposed to an insertion or deletion; in this case, you iterate through the enumerated new people array and find the person in the new array who doesn’t match the old one at the same index. You initialize peopleChange to none to indicate no change. You will eventually return peopleChange from this method. If the new array is larger than the old array, changedPerson was inserted; if the new array is smaller, changedPerson was removed; if the new array is the same size as the old array, changedPerson was updated. In each case, use the person returned from changedPerson(in:) as changedPerson‘s parameter. You return the Diff with peopleChange, the original PeopleModel and the updated PeopleModel. peopleModelDidChange(diff:) takes PeopleModel.Diff as a parameter, then it updates the UI based on the changes in the data model. If diff‘s peopleChange is an insertion, insert a table view row at the index of that insertion. If peopleChange is a deletion, delete the table view row at the index of that deletion. If peopleChange is an update, reload the updated row. Otherwise, if there was no change, exit the method without updating the model or UI. Set the class’s peopleModel to the updated model. modifyModel(_:) takes in a closure that accepts a pointer to a variable PeopleModel. var peopleModel holds a mutable copy of the class’ peopleModel. oldModel holds a constant reference to the original model. Perform the mutations on the old model to produce the new model. Begin the series of tableView changes. peopleModelDidChange(diff:) executes the tableView insertion, deletion, or reload as determined by modelDiff peopleChange. End the table view updates. to swap the person at the selected index with his or her updated version. Next, you’ll add the ability to delete and add people to your people table. 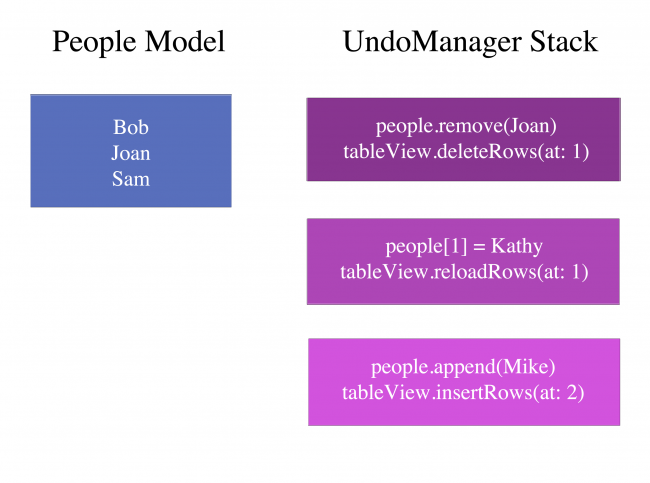 to remove the person at the deleted index from both the data model and UI. The class variable tagNumber keeps track of the highest tag in the people model. As you add each new person, increment tagNumber by 1. A new person originally has no name, no likes nor dislikes, and a default face configuration. His or her tag value equals the current tagNumber. Add the new person to the end of the data model and update the UI. Select the row of the new item — i.e. the final row — and transition to that person’s detail view so the user can set the details. You’re not done yet — PeopleListViewController‘s undo and redo aren’t functional. Time to code one last bit of counter-sabotage to protect your contact list! Register an undo operation capable of undoing data model and UI changes. Modify the people model by replacing the current model with the previous one. Enable/disable undoButton and redoButton appropriately. so that the controller can undo/redo in response to the shake gesture. That’s it! Build and run. You can edit, add, undo, redo, shake, etc. Download the final project using the Download Materials link at the bottom or top of this tutorial to see how it compares to your version. To further explore the UndoManager API, try grouping undo features, naming undo actions, making undo operations discardable and using the various built-in notifications. To further explore value types, try adding properties to Person and PeopleModel to make your app more robust. And if you want to make your PeopleKeeper really work for you, add data persistence between app launches. 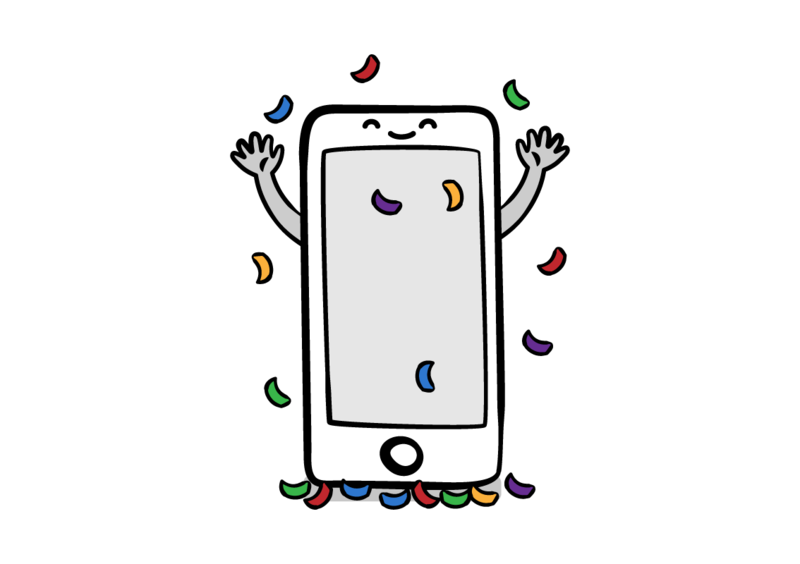 See our “Updated Course: Saving Data in iOS” for more information. Have any questions, comments or suggestions? Join in the forum discussion below!